Here is a boy-saint who died at the age of fifteen, was one of the great hopes of St. John Bosco for the future of his congregation, and was canonized in 1954. He was one of ten children of Carlo and Birgitta Savio. Carlo was a blacksmith and Birgitta was a seamstress. When Don Bosco was looking for young men to train as priests for his Salesian Order, his parish priest suggested Dominic Savio. Dominic became more than a credit to Don Bosco's school—he single-handedly organized those who were to be the nucleus of Don Bosco's order. 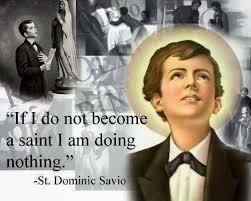 St. Dominic Savio was twelve when he met Don Bosco and organized a group of boys into the Company of the Immaculate Conception. Besides its religious purpose, the boys swept and took care of the school and looked after the boys that no one seemed to pay any attention to. When, in 1859, Don Bosco chose the young men to be the first members of his congregation, all of them had been members of Dominic's Company. For all that, Dominic was a normal, high-spirited boy who sometimes got into trouble with his teachers because he would often break out laughing. However, he was generally well disciplined and gradually gained the respect of the tougher boys in Don Bosco's school. In other circumstances, Dominic might have become a little self-righteous snob, but Don Bosco showed him the heroism of the ordinary and the sanctity of common sense. "Religion must be about us as the air we breathe," Don Bosco would say, and Dominic Savio wore holiness like the clothes on his back. He called his long hours of prayer "his distractions." In 1857, at the age of fifteen, he caught tuberculosis and was sent home to recover. On the evening of March 9, he asked his father to say the prayers for the dying. His face lit up with an intense joy and he said to his father: "I am seeing most wonderful things!" These were his last words. Thought for the Day: "I can't do big things," St. Dominic Savio once said, "but I want everything to be for the glory of God." His was the way of the ordinary: cheerfulness, fidelity in little things, helping others, playing games, obeying his superiors. This heroism in little things is the stuff of holiness.